My little super heroes have options. Patric's is a bit shorter because that's how much of the light green fabric I had. 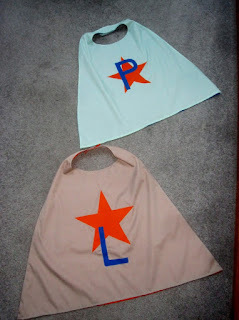 At least Luc and Patric can tell which cape is their's. If they prefer lightening bolts and brighter colours, all they have to do is flip it over. The neck area has hook and loop (Velcro) tape and I topstitched the edges for a nice finish. The bottom hem is left open. Here's the pattern if you want to make your little person a cape. I'm off to sew something else now but I'll link to The Needle and Thread Network first. How playfully clever, Dolores! You'll be their favourite grandma for a long, long time! Good to see you are filling a tickle trunk for them. 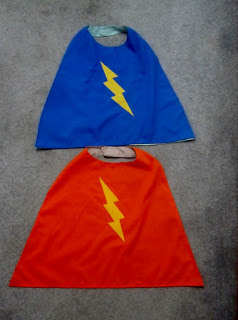 A superhero cape is right for most any occasion. These must be so fun for them to play in and use their imagination! Very cute and I love the personalized touch. Grandmother doe it again. Super cute! they will love them. Love your capes! The lightening bolts are fabulous, reminds me of Harry Potter. There will be two pretty happy little super heroes I think!